"Frederick of Bohemia" redirects here. For the later king of Bohemia, see Frederick V, Elector Palatine. 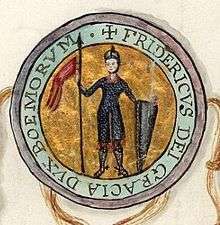 Frederick (Czech: Bedřich) (died 25 March 1189) was the Duke of Olomouc from 1164, then Duke of Bohemia from 1172 to 1173 and again from 1178 to his death. He was the son of King Vladislaus II, who abdicated in 1172 in his favour. He was unable to hold on to his duchy, however, because his tenancy was approved by neither the national diet nor the emperor. He was deposed in September the year following by the emperor at the Diet of Hermsdorf. The Emperor Frederick I, godfather and namesake of Frederick, nominated Oldřich, son of Soběslav I, but he renounced the throne in favour of Soběslav II, who was sympathetic to the peasantry, but antagonistic to both nobles and the emperor. Frederick allied with the emperor and defeated Soběslav at the battles of Loděnice and Prague. The emperor recognised Frederick as an imperial prince, but he also raised the bishop of Prague, Henry Bretislaus, to princely status, making him a direct vassal of the emperor. He also appointed Conrad Otto margrave over Moravia and thus divided the duchy into three parts dependent on him. When Frederick, who was practically a puppet of the emperor, died, he was succeeded by Conrad Otto.